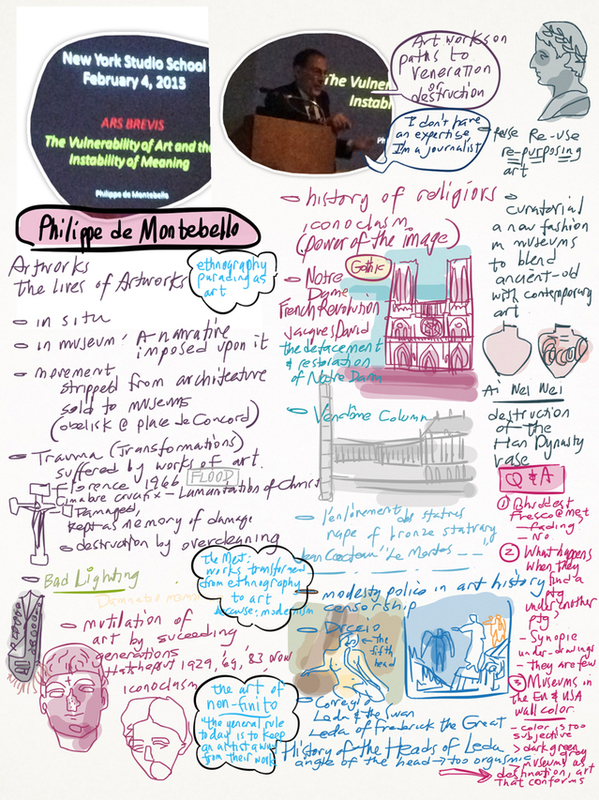 These are notes taken from a talk by Philippe de Montebello at the New York Studio School. The talk was interesting enough, but not as electrifying as it could be. "The Lives of Artworks" was delivered as if a sack of ideas were dumped on a table. P de M examined each in turn and did little else with them, a disappointment that was tempered by his residual and unaffected charisma, exuded effortlessly. He looks as if he was genetically engineered for his occupation. Perhaps the ease of fitting his role so perfectly relieves him from the burden of making his role fit him instead (flag this, Dennis: there is something interesting here- a role, wrought = a historical agent of change). As he talked, I marveled at the simultaneous fragility and robustness of meaning in art and within artwork, the former indicating the artist and the latter society at large. He said: "Art walks on paths to veneration or destruction". I was glad to hear him say this, I've always thought that artwork automatically migrates in one of two directions, either to the landfill or a museum. It was satisfying to hear it come from such an art world éminence gris.